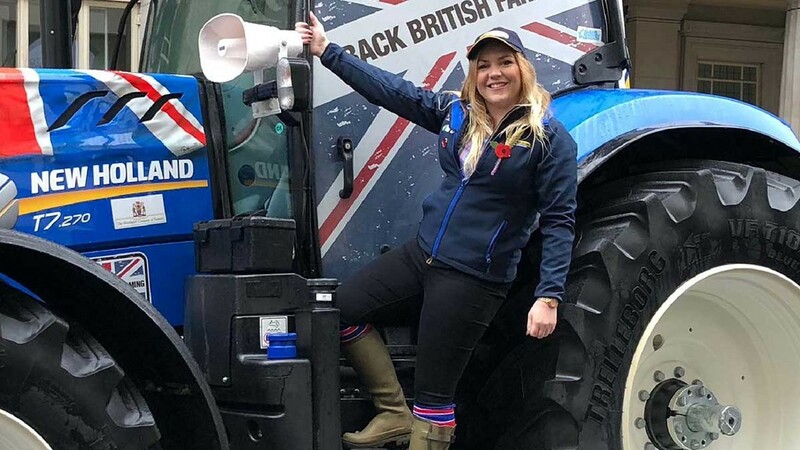 Farmers Guardian - Blogs - Young Farmer Focus: Jessica Spencer - "It's fantastic to be promoting the great work farmers do"
Young Farmer Focus: Jessica Spencer - "It's fantastic to be promoting the great work farmers do"
Jessica, 20, grew up on a farm in Nottinghamshire and is passionate about promoting farming. She also helps run the farm shop, which sells home-reared beef and homemade bread and cakes. Lord Mayor’s Show: What a weekend! On Saturday I attended the annual Lord Mayor’s Show in London representing The Worshipful Company of Farmers, supported by the National Farmers Union and UK-based machinery company New Holland. Myself and seven other young farmers from the UK were selected to represent their home region. We took to the streets of London to spread our pride and passion for UK agriculture while highlighting the message that as farmers, we are ‘proud to produce your food’. We wanted to engage with consumers and inform them about where their food comes from and the importance of ’backing British farming’. Farming only tends to make the headlines after a crisis or disaster, so it was fantastic to be promoting the great things farmers do daily. Growing population: We took with us two major pieces of kit from New Holland, A T7 Tractor and a CR 8.80 Combine. It is not every day you see a combine harvester driving through the centre of London. The CR 8.80 combine attracted some attention – and rightly so. This piece of technologically advanced equipment is capable of harvesting six hectares (14.6 acres) per hour, with one hectare producing nearly 11,000 loaves of bread. The next few years are going to be tough for the food and farming industry, with Brexit negotiations and the reality that by 2050, we will need to feed nine billion mouths on this earth. We need to look towards technological innovation to enhance our food production volume, quality and availability to avoid a global food deficit. As the next generation of farmers, we say ‘bring on the challenge’ and we look forward to the future of British farming. Technology: My passion lies with technological advancement to ensure we can sustainably meet food demands. As much as I fear to comprehend a world run by robotic machinery, it is essential to facilitate innovation to complement modern practical farming. For me, farming has always been a lifestyle, not a career. As a child on a farm, the most valuable memories I have are working alongside my father and grandfather. The traditional, practical values passed on through farming generations is what makes the UK agricultural industry s valuable. We choose to invest our time, effort and passion to provide food not just for our nation, but for our world.